The Green Eyed Cup Coral is handsome, especially with those special 'nose' protrusions that distinguish the Elephant Nose Corals! The Mycedium genus is very hardy and one of the easiest to keep corals of the Pectiniidae family. It has a unique appearance that is very popular with many aquarists. The "bumps" on the surface of the coral resemble down turned noses, and on very colorful specimens, green eyes. The coral grows in a flat or plate form and is usually oriented in a vertical position. The protruding corallites on the face of the coral angle outward towards the perimeter, hence its common names, Green Eyed Cup Coral, Chinese Lettuce Coral, Peacock Coral, and Elephant Nose Coral. Though the Mycedium species' common color is gray, thus dubbing this genus as "Elephant Nose Coral", they can be extremely colorful. They can be a mix of light or dark gray, brown or green, and colors like yellow, red, and pink. A gray that looks almost blue, has also been seen. Not only that, but the aquacultured colors of yellow, fluorescent green, red, and many more, make this a very desirable coral. Some can even have a blue color if not under strong lighting. The hardiness and unique appearance of the Green Eyed Cup Coral Mycedium sp. makes it an excellent choice for the reef aquarium. It is easy to moderate to care for as long as proper lighting and water movement is given. They are tolerant of lower levels of light, but will grow better with stronger lighting. Like all small polyp stony (SPS) corals, it gets much of its nutrition from the zooxanthellae that lives in it tissues, but can also be fed brine shrimp, mysis shrimp, cyclopeeze, and other similar sized foods. However, it only feeds at night, when its feeder tentacles are extended. The Mycedium species have been successfully propagated in captivity, helping to keep wild colonies in tact. This genus was only occasionally available in the past, but with captive propagation they are now easy to find. Aquacultured specimens can be very colorful and vivid, and the best colored specimens can easily run $50.00 USD and more. Distribution / Background Mycedium Coral Information: The Mycedium genus was described by Oken in 1815. There are three nominal species, but only two of them are true species, they are M. elephantotus and M. robokaki. They have been propagated in captivity. Names these corals are know for are due to their natural color and shape, as well as propagator given names. A few names are Elephant Nose Coral, Peacock Coral, Chinese Lettuce Coral, Green-eyed Cup Coral, Chalice Coral, Tyree True Robokaki, Mycedium Coral, and Plate Coral. Where Mycedium Corals Are Found: The Mycedium genus are found in the Indo-Pacific Oceans and the Red Sea. Mycedium Coral Habitat: The Mycedium genus habitats includes shallow front reef areas, but also deeper areas near edges of overhangs and steep drop offs. They are all usually oriented in a vertical position and are found at depths of 20 - 131 feet (6 - 40 m). Description What do Mycedium Corals look like: The Mycedium genus grow in a flat, laminar plane, or plate form. Colonies can have several "plates" growing on different planes. Their corallites are raised and tubular, but angled outward, having an almost human nose shape. The specimens from deeper waters form more of a plate like growth with a "grainy" or rough surface. They are all usually oriented in a vertical position. They have spiny septa protruding from the corallites, along their entire length, but these are only visible when the coral is not expanded. They have clear sweeper tentacles that appear at night. The colors of the Mycedium genus can be a mix of light or dark gray, brown or green and colors like yellow, red, pink, and a gray that looks almost blue, have also been seen. The oral discs can sometimes be red or green. Due to the color gray being common with this genus, the term "Elephant Nose Coral" was dubbed. Green-eyed Cup Coral, Peacock Coral, Elephant Nose Coral - M. elephantotus: This coral has the "nose" like corallites. its surface has what looks like tiny ribs, or like straight "wrinkles". They radiate outward and continue over the corallite "noses", as if they got in the way. This coral can be brown, gray, green or pink with red or green oral discs and at times can have a contrasting color around the margin of the colony. Chinese lettuce coral, Elephant Nose Coral - M. robokaki: This coral has similar features to M. elephantotus. One difference is the edge, which looks like large scalloped shapes instead of being more even. The other difference is the colors, they are brown and or green with bright pink oral discs. Some grays can have a blue appearance under moderate lighting. Difficulty of Care Mycedium Coral Care: The Mycedium sp. are easy to moderate to care for as long as proper lighting and water movement is given. Foods / Feeding Mycedium Coral Feeding: In the wild, small polyp stony (SPS) corals have developed several feeding strategies. Through a symbiotic relationship with a marine algae, known as zooxanthellae, they receive the majority of their nutrients. They also capture planktonic organisms, food particles from the water column, and can absorb dissolved organic matter. In captivity, they do best in well-feed reef tanks. Like other SPS, they use their zooxanthellae for nutrition. They can also be fed microplankton, cyclopeeze and other similar sized foods at night when feeder tentacles are present. Aquarium Care Pristine tank conditions are typically needed to keep all SPS corals. Keep the nitrate levels low, and maintaining calcium and alkalinity levels. Typically you can do water changes of 20% a month, 10% biweekly or 5% weekly. It has been noted that 5% weekly water changes replenish many of the needed additives. With higher concentrations of coral with calcareous skeletons, there may be a need put in additional additives to maintain proper levels for good growth. When keeping this coral, using carbon may prove useful and beneficial for the other corals. Additions of trace elements are also suggested. Magnesium: 1200 - 1350. (approx. 1272 ppm is suggested) Magnesium makes calcium available, so if your calcium is low, check your magnesium levels before adding any more calcium. A well-feed live rock/reef environment is what is needed for your Green Eyed Cup Coral , along with some fish for organic matter production. A mature tank is recommended. The Mycedium corals must be placed or mounted vertically. They should be kept under moderate to bright light with moderate water movement to keep them healthy. Make sure that no other corals can come in contact with your Mycedium. Mycedium spp. are aggressive, and will sometimes extend sweeper tentacles that will sting nearby corals. Minimum Tank Size / Length: 29 gallons (115 L) and up, depending on size. Compatibility and Social Behaviors The Mycedium genus are aggressive, forming stinging sweeper tentacles at night. The Green Eyed Cup Coral needs to be kept away from other corals as it will sting any that it can reach. These corals can have a a sweeper tentacle length of up to one foot. Although the sweepers do not come out every night, be sure to take their reach into consideration when placing them. It is possible they may inhibit the growth of soft corals. Breeding and Reproduction The small polyp stony (SPS) corals are male and female and can reproduce both sexually and asexually. In the wild they reproduce sexually by releasing eggs and sperm at the same time, resulting in a fertilized egg which then forms into a free-swimming planula larva. Eventually the planula larvae settles onto the substrate, becoming plankters. This then forms a tiny polyp which begins to excrete calcium carbonate and develops into a coral. Planula larvae are extremely vulnerable to predation, and very few survive. Mycediums reproduce asexually as well. In the wild Mycediums spread from breakage due to storms and fragmentation. Propagation is easy for Mycedium corals. The frag should be taken from an already healthy and settled colony. It is done with very clean cuts in the skeleton of the mother colony with a fresh razor blade. Cut straight in from the outer edge about 1", remove and at 1" away from the original cut, cut parallel in about 1" and snap off the section in-between each cut. Make sure to mount the frag vertically and put it in a clean frag tank to recover. Wearing protective gloves is recommended. Potential Problems The Mycedium spp. are generally disease resistant, but do not tolerate poor water conditions very well. They can get the same illnesses that any other small polyp stony (SPS) coral can get under poor conditions. Protozoan brown jelly infections are common in this group. You want to prevent this infection from spreading. Siphon off any "jelly" before lifting the coral out of the tank, then use a baggy to collect the coral, keeping the infection contained. Put it into an isolation tank that is separate from the main tank. A 3 minute freshwater dip, with the water being the same temperature and PH as the sea water the coral is in. Iodine baths using one drop of Lugol's iodine per 5 gallons of sea water may help, but the bath needs to last around 15 minutes and aeration needs to be high. Some have applied iodine directly to the affected area before putting in the iodine bath. Use tetracycline in sea water baths that last up to 5 hours a day. The coral must be put in fresh sea water in-between each treatment and treatment water must be discarded. 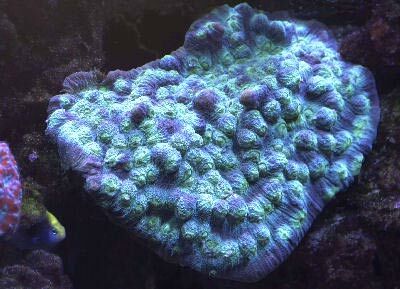 Availability Mycedium Corals for Sale: The Green Eyed Cup Coral Mycedium sp. is very easy to find at pet shops and on line. Online they can run from about $50.00 to $100.000 USD depending on size and/or color.